You can use a Q & A pod to answer questions posed by attendees. When a presenter answers a question, the question and answer appear as pairs in the Q & A pod. Hosts can give participants enhanced rights, letting them answer questions as well. See Assign enhanced participant rights . During a large meeting, questions are added to a queue on the Q & A pod while the speaker presents. After completing the presentation, the speaker reviews the messages, applies a filter, and begins answering the questions. A meeting moderator answers logistical questions but forwards technical inquiries to an engineer, who is presenting. A meeting moderator returns certain replies to the sender only. Replies that are relevant to all attendees are sent to everyone in the meeting. By default, hosts and presenters see the Q & A pod with additional controls, but you can quickly see questions with answers as participants do. Presenter View displays additional filtering and assignment controls visible only to hosts and presenters. Participant View displays the simple list of questions and answers that participants see. In the upper-right corner of the Q & A pod, click the menu icon . Choose Move Presenter View to POA. Note: To return the Q & A pod to the Share area, in the Presenters Only Area click and choose Hide. 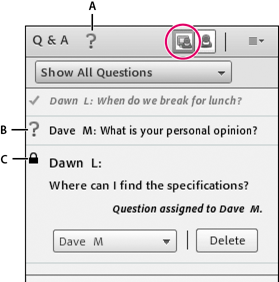 In the Participant View of the Q & A pod, type your question in the text box at bottom. To the right of the text box, click the Send Question button , or press Return. Select an incoming question from the list. Type your answer in the text box at the bottom of the pod. Sends the answer to all meeting attendees. Sends the answer only to the attendee who sent the question. You can assign questions to presenters with specific expertise, including yourself, preventing others from answering. In the Presenter View of the Q & A pod, select the question from the Incoming Messages list. Select a presenter name from the Assign To pop‑up menu. Presenters can reassign questions to other presenters or choose None to cancel assignment. If you are a host or presenter, you can add a filter to the queue of questions in a Q & A pod so that you can see certain questions while hiding others. You can also forward a question to another presenter to answer. 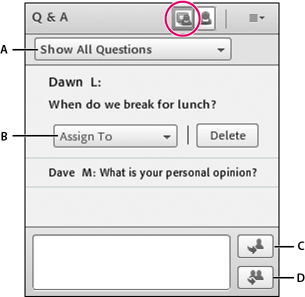 In the Presenter View of the Q & A pod, click the pop‑up menu in the upper-left corner. Displays all questions that you have received, starting either with a new pod or from the last time the pod was cleared. Displays all unanswered questions not assigned to anyone. Displays all questions that have been answered. Displays only unanswered questions that have been assigned to you. In the Presenter View of the Q & A pod, select a question. By default, attendee names appear next to submitted questions, but hosts and presenters can hide those names in Participant View. In the list at left, select Q & A pod. Deselect Show Submitter Name or Show Presenter Name. Choose Export Q & A Logs, and then select either Save As RTF or E-mail Q & A.